Cleaning services, Cleaners and maids in Cardiff, Swindon, Portsmouth and Yeovil from Quickcleaner. We provide cleaning and housekeeping services for people that need them. ​We provide you with an excellent, trustworthy cleaner without any fuss. An experienced professional that lives close to you, is available when you need them and has passed our strict five point approval process. QuickCleaner offices in Cardiff, Portsmouth, Yeovil & Swindon ​manage a large number of dedicated maids living across the region. We have customers and local professional cleaners in all areas of Cardiff, Portsmouth, Yeovil and Swindon as well as the surrounding towns and across Glamorgan, Hampshire, Somerset and Wiltshire. We can provide all domestic sanitation, housekeeping and maid services as well as laundry and ironing. Our skilled cleaners are happy to undertake all types of internal cleaning for the same low hourly rate as well as laundry, ironing and housekeeping work as required. We can match you with someone who is experienced in any aspect of housekeeping or laundry work, just let us know what you need. Generally speaking our cleaners are happy to undertake all reasonable internal cleaning and clearing tasks, including sanitisng bathrooms, kitchens and ovens, washing up, hoovering, dusting, polishing inside windows, removing rubbish tidying and sorting. If you have a particular requirement just let us know. Intensive maintenance of bathrooms and kitchens. Cupboards insides and outsides and washing floors. Dusting of surfaces,skirting boards, pictures, lamp shades, ornaments, window sills, furniture and light fittings. ​Let us give you some time back! We build long term relationships with our associates and treat them fairly. This gives us strong loyalty which means great service for you. The agency fee you pay will never increase during the life of your contract even if you change your cleaning requirements. 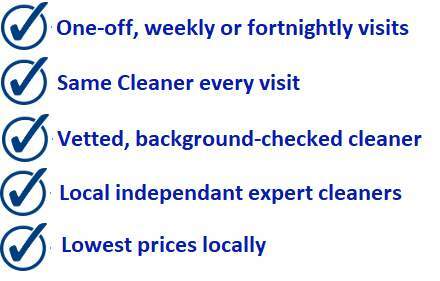 We have the lowest house cleaning prices of any commercial cleaning company in your area. Our average cost of house cleaning services is less than £11 per hour. As well as domestic cleaning we can supply commercial cleaning services including office cleaning and cleaning of other commercial properties. 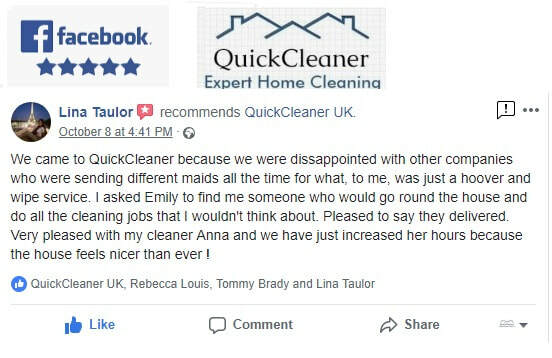 We do use independent cleaners at QuickCleaner, this is because our long experience has taught us that this approach gets the best approach for our customers. ​Since the job involves a lot of unsupervised working and a close relationship with the client it stands to reason that the best results, the brightest, sparkliest homes, come from cleaners that are fully engaged and committed to their jobs. With traditional fully employed cleaning companies you run the risk of getting a cleaner that is just working the 9-5, a cleaner that is going through the motions or doesn't take a personal pride or responsibility in their job. However all of our cleaners are fully vetted, self-employed professionals that actually each run their own micro businesses. When you decide to take one on as your regular cleaner they treat you as their own private client and they accept responsibility for delivering the best service to you. So why do you need QuickCleaner? why not cut out the middleman? If you are looking at our services there is a high chance you already know. Firstly good cleaners are not very easy to find. The size of our organisation and the number of cleaners we work with give us the ability to invest a huge amount on promotion, marketing and advertising. These types of resources are not available to the typical cleaner let alone the time it all takes, the best cleaners would rather be cleaning than trying to write adverts and develop websites so they come to us to do it for them. Now assuming you do manage to find a independent cleaner on your own. Well that is wonderful - if they are good and they turn up then you are definitely on to a good thing. however there is no guarantee of either of these things and you could run the risk of investing a lot of time and effort into a cleaner that is not up to the job or someone who doesn't turn up or disappears after a few weeks and then you are back at square one looking again. We have time to do that because its our business but do you? 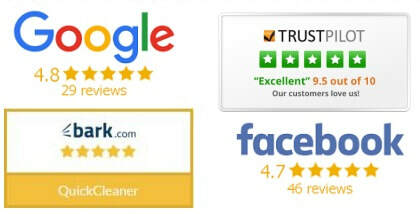 We thoroughly check, vet and reference all of our cleaners through our rigorous 5 step approval programme, it means that you can rest assured that the cleaner is a genuine expert and can do what you need and that they are reliable and we be where they say they will be when they say they will be there. ​We also take care of all HMRC right to work checks. This is hugely important. Employing someone for work who doesn't have the right paperwork can cause you serious issues. Even on a casual basis and if you didn't know, you could face huge fines or possibly worse. The final thing is that we don't just offer an introduction, we stay here and actively manage your account for you. Cleaners take holidays, cleaners get sick or have personal emergencies and sometimes cleaners move away from the area or take different lines of work, these are the issues that we are expert on resolving. 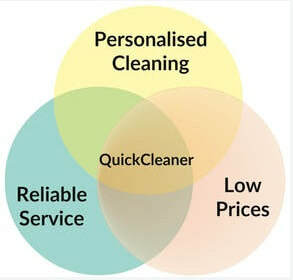 Working with QuickCleaner you will never be short of a cleaner when you need them. Your agency fees cover introduction of a cleaner (or more if you don't find your perfect match straight away) then cover for holidays, sickness and absence. A replacement cleaner if they leave and quality management if you need it. We can have those difficult conversations on your behalf if they are ever necessary. There seems to be a new breed of cleaning company popping up, places like Helpling or Airtasker that treat cleaning services like Uber. The thing is getting a housekeeper is nothing like Uber. To a certain extent anyone with a car can drive you from A to B so the system works but cleaning is a much higher skilled profession and a highly personal service. Most of our cleaners hold keys to their customers home, something you wouldn't do with an Uber driver. The sad truth with these services is that they are run by complicated algorithms and fancy websites and that just cannot replace the personal touch. We know our cleaners, we know our customers and we match-make individually, not automatically from a head office in Berlin! This is the most popular service we offer, for people who don't have the time or ability to keep on top of housework or those that would rather spend that time of more important things. Professional cleaners can remove the burden from your shoulders and start a routine of regular cleaning and maintenance that will make your house feel hotel clean every day. A move in clean can be really nice as well, getting some professionals in to scrub away every trace of the previous occupants before you move in to your new house can really speed up how quickly it begins to feel like a home. A top tip is to make sure you use the same cleaning products as in your previous property, that way the clean fresh smells will be familiar and help all members of the family feel settled.